INTEGRITY AT WORK … Do Your People Care? No, REALLY, Care? Truthfully, I felt helpless as neighbors went back to their Sunday activities, no interest in helping to save this hungry lost little dog. He ran down the alley where my car couldn’t go and I lost sight of him, although I patrolled the area for another hour. The more I heard from people, “It’s not your problem”, the more I started to wonder what allows people to look away from something they CAN do and close their hearts. Were their afternoon activities really that important in comparison? I couldn’t bear the thought of finding his body along the side of the road because “it’s not your problem, you tried.” I couldn’t stop thinking about that little dog and how to make sure he was safe. How did “It’s not your problem” become an acceptable reason to stop caring? This morning, I caught sight of him again on a side street near a park and slowed my car, trying to lure him toward me. Then from out of nowhere a truck appeared. 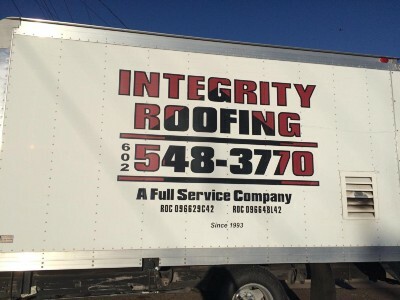 On the side of it in bold red & black letters were these words “Integrity Roofing”. The two young guys -Tony & Joe – saw what I was doing and joined in, trying to tempt him with little bites of cinnamon roll. Eventually, our efforts turned into an all-out chase, almost like the kind of caper you’d see in an action film. The dog was on the run, but Tony & Joe were in hot fast pursuit- sometimes on foot, sometimes in either their truck or my car. For more than half an hour, we three gave chase, around neighborhoods, into alleyways, through parks. Their worry was palpable as the dog veered again onto the main road in morning rush hour traffic. I already had my hands up to my mouth as I screamed. At the last possible second, the little dog darted off the road and back into the neighborhood. Both men said, we’re not giving up! Finally, Tony managed to chase him into a yard and close the gate. 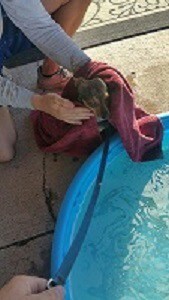 Joe lay calmly on the pool deck coaxing the scared little stray toward him, until he could slip a leash I carry in my car around his neck. Eventually, this was the photo I captured of the sweet little dog nestled in their caring arms. His nails were bloody and ragged from all the running, his body was thin but his heart was full, knowing that these two men just wouldn’t give up on him. It’s so easy to slap a name like Integrity on a company, but when their people live it, in ways that have nothing to do with promoting their business, THAT’S when you know it’s real. 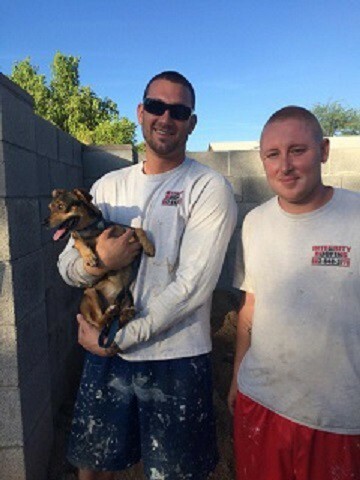 Bravo, Integrity Roofing … your men display it in everything they do.